Back in the day, in the days of explorers like Ponce de Leon, the Dry Tortugas were a remote wildlife area filled with all kinds of sea and land species. One of the most prominent animals that made the Dry Tortugas their home were massive sea turtles. Because of this, Juan Ponce de Leon, the explorer who discovered the Dry Tortugas in 1513, named the islands Las Tortugas, which means The Turtles in Spanish. The name was later changed to the Dry Tortugas as a reference to the lack of drinkable fresh water in the islands (making them dry). Over the centuries, hunting and other human activity has largely decreased the number of sea turtles out on the Dry Tortugas. Turtling was actually quite a big business in the 18th and 19th century, with the turtle meat being a food source for a variety of sea-faring people. Despite this, you can still see quite a few today, especially during nesting season. 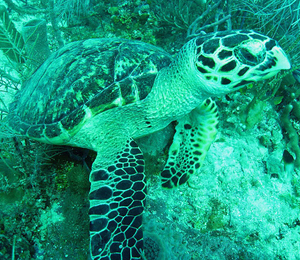 The types that are typically seen on the islands are the loggerhead turtle, the hawksbill turtle, and green turtles. You can often see them swimming around the Gulf of Mexico as you travel to the Dry Tortugas from Key West. To get an idea of the decline in the turtle population you can compare the approximate number of sea turtles before the Industrial Revolution to today's approximate number: 660,000,000 compared to something in the tens of thousands. The Dry Tortugas today are still the leading nesting site for turtles in all of the Florida Keys and, ever since the area's induction as a National Park, the turtles activity has been monitored by marine biologists. These scientists are able to mark and record the spots where the turtles lay their eggs, and then section them off for further protection. These are endangered animals and they are great to see but try not to interact with them as that can be dangerous for both the turtles and yourself. Admire these majestic and interesting creatures from afar.